The way people adapt to changing conditions generated by the complex and slow process of infrastructure projects is often overlooked. 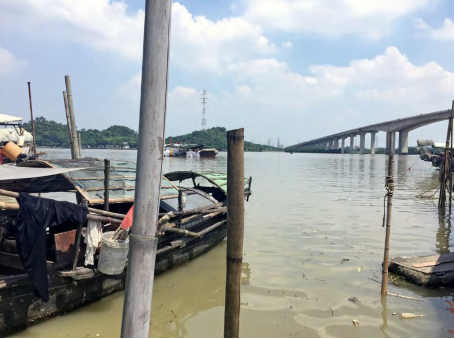 Through the case of the Pearl River Delta in China, this text deepens into how infrastructure processes generate threshold conditions: between river and sea, rural and urban, and even between global development and local culture. 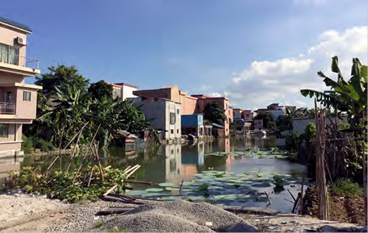 Most studies and research in and around the Pearl River Delta (prd) are often based on a larger narrative of the relationship between rapid urbanization of the cities around the delta, its relation to the Hong Kong tax-free zone and the dispossession of land or privatization as an outcome of post-industrialization. The dichotomy between rural and urban areas and the dynamics between them is, however, a less popular topic in research related to the PRD. Moreover, large infrastructure projects such as bridges or the use of islands as infrastructure itself are a phenomenon in the PRD sea. Politically and legally, the defined sea and water area of the prd is an invisible borderline. Therefore, it is also a space where threshold activities are happening. For researchers map Office, the Pearl River Delta is a fluid space of many constituent parts like bridges and artificial islands: “as an experimental territory, the delta is a mutant corpse consisting of wild juxtapositions, with localized and unique dead parts below the next flourishing plot” (MAP Office, 2002:92). On the other hand, from a Western research point, “deltas have been (understood) as forces that extend the terrestrial world into the sea” (Morito & Jensen, 2016:3-4). By defining ‘delta’ from an ontological base, Morito & Jensen mean “not only (to bring) attention to how people understand and live with deltas but also to their infrastructural and cosmological dimensions” (Morito & Jensen, 2016:5). The prd presents such an ontology where infrastructures and the water flow create a flux of movements of people, plants, animals and capital. Recently, the discourse on infrastructure presents discussions that reveal its role in more complex ways. The incompleteness and failures of infrastructure are often related to the nature of the infrastructural functions that prolong the process of the projects. The process becomes more important than the complete infrastructure itself, where actors such as the state, local governments, developers and citizens debate or negotiate, which leads to more profit-making and surplus. In short, instead of the complete object or presentation itself, the incomplete, the continuous failure or the process of infrastructure becomes the vital part. It is often argued that in many cases (for example in Indian cities), the failure of infrastructure or interruption of the infrastructural function brings co-existences of alternative ways of infrastructure in the network of such cities. (…) trades on ephemeral desires and irrational aspirations. Organizations of every kind - from celebrity golf suburbs to retail chains to zones - attempt to profit, govern, or otherwise maintain power with instrumental forms of meaninglessness. Fuente: Meyers Konversations-Lexikon: eine Encyklopädie des allgemeinen Wissens. Leipzig: Verlag des Bibliographischen Instituts, 1890, 474. 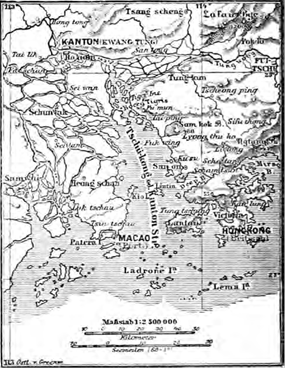 Figure 3 Location map of Guangzhou, Macau and Hong Kong, 1890. Since the launch of the Open Door Policy (1979) of Mainland China in the prd region, four Special Economic Zones (sezs) were located in the region (1984). The cities Shenzhen, Zhuhai, Hong Kong and Macao are still magnetic zones that are in a reciprocal relationship in terms of economical dependency from export-oriented manufacturing for the current housing and infrastructural investments. In 2008, China announced plans to mesh Guangzhou, Shenzhen, Dongguan, Zhaoqing, Foshan, Huizhou, Jiangmen, Zhongshan and Zhuhai into a single megacity. A series of massive infrastructure projects are underway to merge transport, energy, water and telecoms networks across the nine cities. A 30-mile-long bridge and tunnel is under construction to join the Pearl River Delta metropolis of Zhuhai to the special administrative regions of Macau and Hong Kong. (Hilaire & Van Mead, 2016). (…) original heavy dependence on Hong Kong transportation facilities to handle the transit of goods produced in the delta, is now challenged by the increasing number of container terminals in Shenzen and other Pearl River towns. 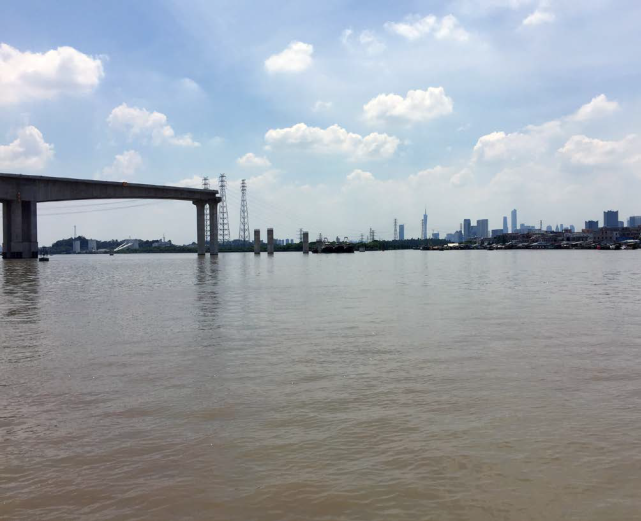 As ports get closer to the production lines, more highways and roads are using Guangzhou’s new infrastructure to connect to previously distant Mainland provinces (…)” (map Office, 2002:74). 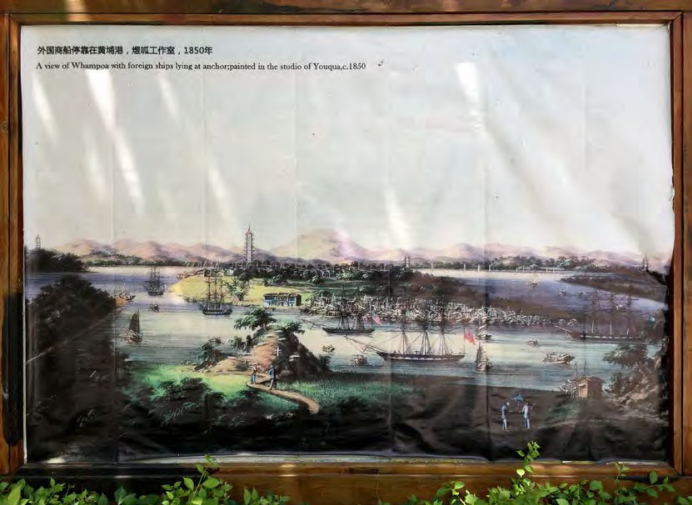 Both the administration of mainland China and the special zones create a special condition of “extrastatecraft.” In Easterling’s definition: “As a site of multiple, overlapping, or nested forms of sovereignty, where domestic and transnational jurisdictions collide, infrastructure space becomes a medium of what might be called extrastatecraft” (Easterling, 2014:25). Considering the sea of the prd region, I think this liquid territory redefines itself as a ‘border infrastructure’; even more, an infrastructure for infrastructure. The construction and future plans of these corridors on the sea affect the built environment of the seashores with new theme parks, residential areas and artificial local tourism attractions in which local farming and fishing practices are squeezed as thresholds of delta. The assemblage of infrastructures leave the local delta practices aside as thresholds that still serve as alternative infrastructure. The bulk of the Chinese stimulus program funds went into the state sector, that is, into the state banks and the state enterprises. The state also strengthened environmental regulations and tightened the tax loopholes on private enterprises in the export sector. For example, many Hong Kong companies said they had to close down their factories in the Pearl River Delta because of the worsening business environment due to new regulations and taxation (So, 2016:100). Many factories diminished their activity and even factories such as Foxconn opened headquarters inland in Chongqing. Thus, in recent years, there has been a transformation of economic surplus from manufacturing to construction and real estate speculation that leads to delta infrastructure and service economies. Farming and fishing labor still exist and are squeezed along the coast in-between investments. The fishing villages in the west part of the prd seashore are hidden in many fragmented lands. Some of those villages are impossible to reach via roads but only by sea. 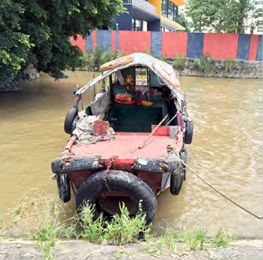 For example, it is much easier to reach the oldest lasting village Xinzhou (新洲) by boat. The inhabitants of the villages are no longer very active in fishing as the contamination of the prd sea increased in the last ten years. The level of poverty is high. There are many other villages which are active, like the Fengmasan Village (南沙冯马三村) in Nansha (南沙). The housing settlement of the village is around a small river that opens to the prd. The village’s hinterland is surrounded with agricultural land. Women in the village produce handmade fishing nets, go fishing, catch seafood to sell to other fisher mongers, and they also clean and dry fish and seafood to sell in the village markets. Villages such as 莲花山附近村落 near Lianhua Mountain (Lotus Mountain, Panyu) and a fishermen’s settlement near Yuzhu Wharf (渔民聚居地, Huangpu) are active in fishing and selling seafood. Those villages have kept the old village structure plan; however, they look more developed, with upgraded housing and public space. 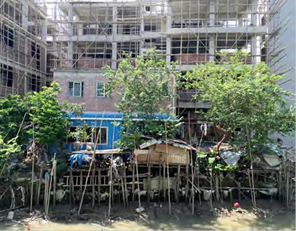 Fishermen’s settlements along the old harbor near Yuzhu Wharf are now under pressure due to new luxury housing projects by developers. Older generation women in the village of 莲花山附近村落 near Lianhua Mountain were once part of a fishing cooperative for many years. However, this cooperative has been disbanded and they now have spent their pension money. Still, women of different ages are engaged in the whole fishing process: cleaning, separating or selling freshly in the prd region. In the village, a fishing couple goes out at 2 am to fish near Hong Kong’s outlying islands and arrives back at 11 am to sell their daily catch to fishmongers. 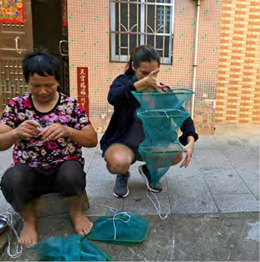 Most of the fishing families have children who now work in the city of Guangzhou as white-collar workers and can hardly pay their city rent. 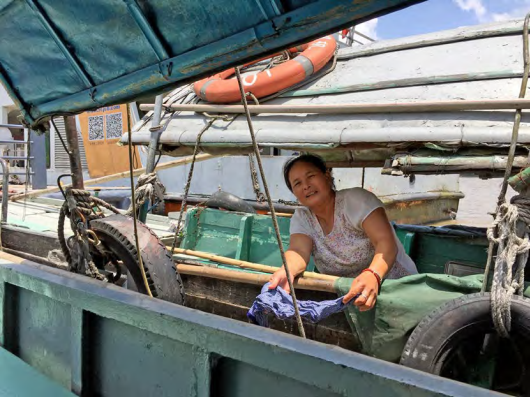 The relationships between female labor, community economies, ecology and the ethics of locality are all a basic framework for the fishing villages and the activity of people in the prd. Several different economic and dissemination structures exist in complex ways, from agriculture to sea economy to urban capital. In this context, how can diverse local economic structures and traditional labor exist in the future of the prd region? From the perspective of J. K. Gibson-Graham, diverse economies and surplus are able to organize outside of capitalist-centered places: “If we can recognize a diverse economy, we can begin to imagine and create diverse organizations and practices as powerful constituents of an enlivened non-capitalist politics of place” (Gibson-Graham, 2006). For the economist geographers: “‘diverse economy’ is one of our strategic moves against the subordination of local subjects to the discourse of (capitalist economic) globalization” (Gibson-Graham, 2013). Starting from female labor intertwined with the local tradition of fish net making and preserving varieties of seafood in the prd region, leads us to think of possible structures of diverse economies in relation to the prd ecology: agricultural farming plots in the hinterlands of the villages, the fish farms in the delta geography, the community economies and the terrestrial transformation of the delta by wild investors. In other words, can the already-in-place infrastructures of local inhabitants become an alternative to the capitalist homogenization imposed by huge infrastructure projects? Sociologist, Ankara University, Ankara, Turkey (1997). PhD in Art History, Technical University of Istanbul, Turkey (2011). Post-doctoral studies in artistic research, Massachusetts Institute of Technology, USA (2012). Her research is focused on urban conflict and territorial politics, gift economy, and the condition of labor. Her articles have been published in Domus, Bauwelt, e-flux, among others. She has co-curated the exhibition Adhocracy (Istanbul, 2012; New York, 2013; Athens, 2015). She has lectured in different universities across the world, and her texts have been published in Promiscuous Encounters (2014), Adhocracy reader (2015), 2000+: The Urgencies of Architectural Theory (2016), among others. Tan is also author of Arazi / Territory (Sternberg Press, 2015), Unconditional Hospitality and Threshold Architecture (dpr-barcelona, 2015), and Towards Urban Society - International Panel on Social Progress -IPSP- (Saskia Sassen & Edgar Pieterse, 2017). She is currently Visiting Associate Professor of Architecture, University Of Cyprus, Nicosia, Cyprus.